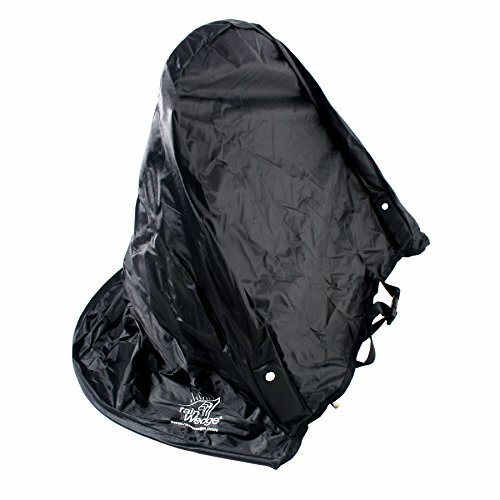 No other rain cover can match the functionality or ease-of-use of a Rain Wedge. Rain Wedge uses the latest technology to create a sturdy, lightweight cover. The clip and strap system secure the Rain Wedge to your bag and it’s guaranteed not to blow away in the wind. Plus, the new weighted front end will make sure the cover stays down during wind gusts. Extremely lightweight, around 8.5 ounces, the Rain Wedge won’t weight you down and it takes up about as much space as a single club. Made of waterproof rip-stop nylon and employing a patented retractable rod system, the Rain Wedge is the “must-have” item for any golfer, male or female, beginner to pro. Easy-access design allows you to use one hand to flip up the cover while your other hand quickly removes a club from your golf bag. Grip clips and strap system attaches to bag in seconds and stays secure. Made of durable, waterproof rip-stop Nylon. Adjusts to be used for carry bags, push carts or motorized carts. Retractable rods system gives you a 14" clearance from the top of your golf bag plenty of room for today's large drivers. Locking zipper ensures the cover will remain secure and closed even in high winds. Conveniently stores in your bag.